The City of Heroes developer almost bought itself from NCsoft to keep the game alive. 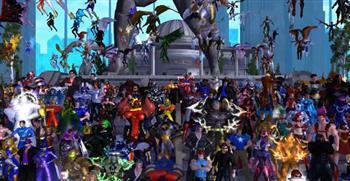 It was August 31st of last year when City of Heroes closed down, taking Paragon Studios and its 80 employees with it. Supported poured out of the internet, but this was one villain too large to defeat. To see the nine-year-old game close so suddenly was a devastating blow to fans. Now we know more about what was happening behind the scenes, and it sounds like fans weren't the only ones fighting for their game. A few months before the fateful closure, Paragon Studio's management was informed that publisher NCsoft was making new plans, plans that didn't include City of Heroes. Instead of simply letting the sun set in Paragon City, the studio decided to shop the game around for a new home. Many candidates were considered, but nothing came together. "We all were really working as if things were going to work out. ... It was business as usual right up until the last day" lead designer Matt Miller told Gamasutra. But Paragon wasn't deterred. "Those guys... really loved what the studio was doing and they really felt that the game still had legs," says Miller. "So, plan B, which I always thought was a great plan from the beginning was the management buyout." That's right, Paragon was planning to secretly buy itself out of the clutches of NCsoft. At its peak, up to 20 employees were in on the deal, with strict orders to keep things under wraps until the time was right. That time never came. "Things looked like they were going to go well and then things just kind of stopped going well... I'm not exactly sure where the sticking points were," says Miller, "but in the logistics of business there's always some sticking point somewhere." Had Paragon's management succeeded in the buyback, Paragon would have retained not just City of Heroes but two other IPs it was working on at the time as well. Because the deal fell through, NCsoft retains those properties, which remains sealed under NDAs. Before the closure, Paragon was working on a massive anniversary update, where players would fight an alien invasion that culminated on a moon base. While Paragon wanted to push the new update out for the final days, NCsoft didn't want to deal with bug complains from the unfinished modual, so the new content died in the electronic darkness. While the game might have closed rather swiftly, the story ends well for Paragon's 80 employees. According to Miller, "anyone who was a full-time employee got 60 days of pay... [and] a lot of people got severance as well on top of those 60 days." Paragon Studios (originally NCsoft NorCal) took over operations of City of Heroes in 2007, when NCsoft purchased the property from Cryptic Studios, the original creators. It made the transition to free-to-play in 2011 (where Miller says that it became more profitable than the subscription model).